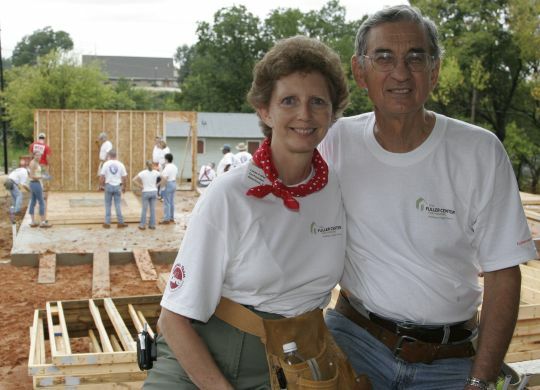 When Millard and Linda Fuller were ousted in 2005 from the helm of the nonprofit housing ministry they had built into a thriving charity over the previous three decades, they justifiably could have seen that as an opportune moment to hang up their tool belts and bask in the glow of their accomplishments. After all, nearly 200,000 families had partnered with the ministry to have simple, decent homes in which they could properly nurture their families and build a strong foundation for their children. The Fullers had more awards and honors than they could count, including a 1996 Presidential Medal of Freedom for Millard. While Millard Fuller had no interest in retirement, he did want to return to the roots with which he and Linda had started the world’s affordable housing movement. He believed a new version of the old ministry would need to go back to the grass-roots, Christian principles that he developed based upon the teachings of theologian Clarence Jordan. 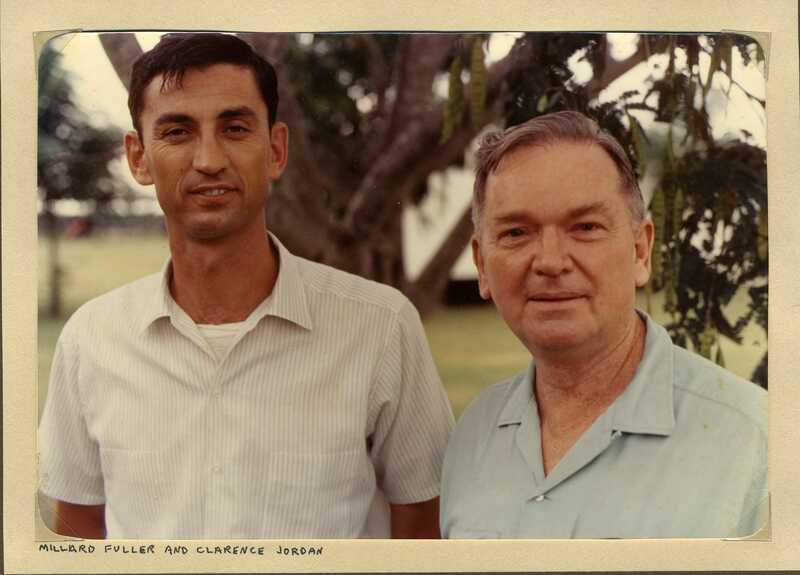 Millard Fuller and Clarence Jordan at Koinonia Farm in the 1960s. Though Millard Fuller passed away more than seven years ago, those grass-roots principles remain firmly intact and often are cited by groups who have chosen to switch their affiliation from the Fullers’ first housing nonprofit to The Fuller Center for Housing. Since 2005, 20 former affiliates of the previous organization have chosen to become covenant partners with The Fuller Center, most coming in the past three years. With the emphasis on local leadership rather than top-down micromanagement from headquarters, The Fuller Center uses a different term than “affiliates” for its local groups — terminology that more aptly represents the relationship between Fuller Center headquarters and those doing the work in the field. “Fuller Center supports the freedom and independence of our covenant partner to do what works best in our community instead of demanding that we do things a certain way.” — Tamara Danel, Ginger Ford Northshore Fuller Center, Hammond, La. For those who’ve left their old nonprofit housing affiliation for The Fuller Center, there are two recurring themes about why they switched: One, they wanted local control instead of micromanagement from a headquarters they increasingly saw as “corporate;” and, two, they said that recent annual fees required by their nonprofit’s headquarters would be better put to use helping families in the field. “We like that there are not layers of middle management between Fuller Center headquarters and our covenant partner,” said Tamara Danel, Director of Ginger Ford Northshore Fuller Center for Housing in Hammond, La., one of the first to make the switch to The Fuller Center. “Fuller Center supports the freedom and independence of our covenant partner to do what works best in our community instead of demanding that we do things a certain way. 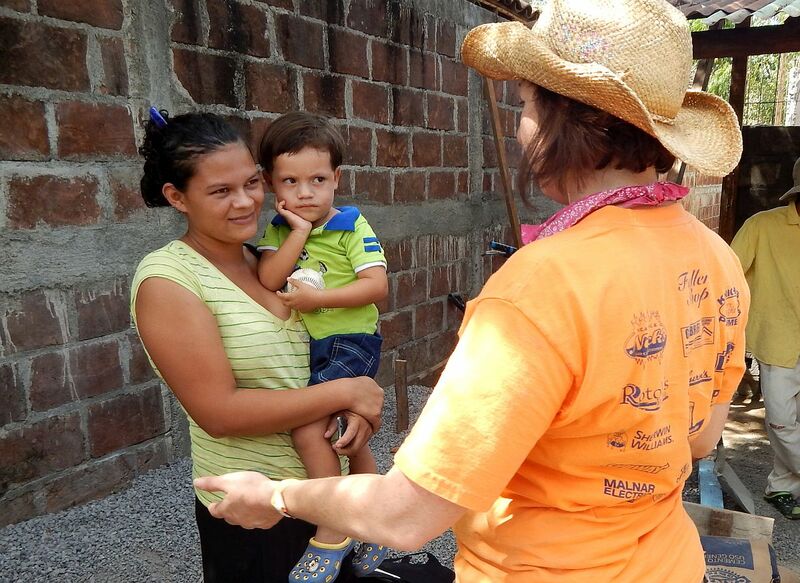 Tamara Danel visits with homeowners during a Global Builders trip to Nicaragua. Randy Rinehart, who leads one of the newest groups to switch in Houston, Miss., cited the ease of working with a non-corporate headquarters, particularly while working in a small rural community. He learned about The Fuller Center through the Fuller Center Bicycle Adventure, whose spring ride takes it through Houston each year. Rinehart’s church, Parkway Baptist, is one of the weeklong ride’s host churches. “The biggest difference that I have seen is Fuller’s people, both on the national level and at the chapters,” said Kermit Rowe, director of the Clark County Fuller Center for Housing in Springfield, Ohio. “When you are committed to God-centered principles in both word and action, that comes across in relationships. Rowe said the primary reason that Clark County switched to The Fuller Center’s model was that they wanted to get back to the Christian principles, just as Millard and Linda Fuller did. But they also had a financial incentive. 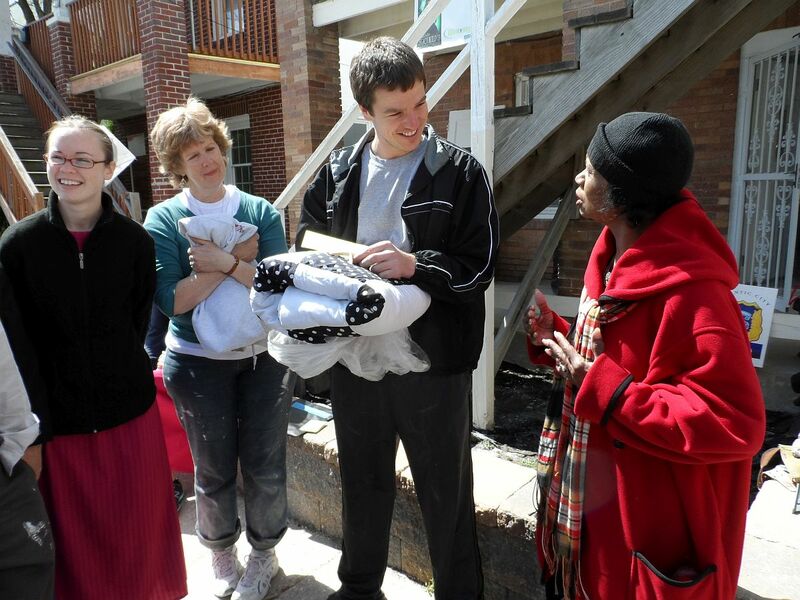 Delores Peoples receives a quilt and Bible from volunteers who repaired her flood-damaged home in New Jersey. The Fuller Center does not require its covenant partners to pay any annual dues or fees, but it does encourage its partners to tithe 10 percent of undesignated funds to help build internationally. However, tithing is not required. “Rather than support us in our circumstances, [the former organization] increased demands for funding over and above our tithe,” said Barbara Curtis, Director of The Fuller Center of Johnson County, Mo., which transitioned to The Fuller Center in 2016. “Additionally, compliance with ever-increasing regulations and requirements became burdensome to us, considering how little assistance they provided. It just seemed our contribution and struggles were under-appreciated. “We found Fuller Center just in time, and our despair has become audacious hope.” — Barbara Curtis, Director of Fuller Center of Johnson County in Warrensburg, Mo. Covenant partners also cited innovative programs in their decision to switch — including the Greater Blessing home repair program. Unlike new home partner families, Greater Blessing partner families do not sign documents guaranteeing their repayment. They are instead asked to repay the costs of materials as they are able. The Fuller Center also promotes the Save a House/Make a Home initiative through which covenant partners take donated vacant properties — often considered toxic assets — and restore them to like-new homes for families in need. Meanwhile, the low overhead at Fuller Center headquarters helps not just covenant partners but others as such volunteer experiences as Global Builders and U.S. Builders trips are very reasonably priced. Partners sign a simple, two-page partnership covenant when they decide to join this grass-roots ministry. The term “partnership covenant” was deliberately chosen to emphasize the use of partnerships in the work of building and repairing homes and the parallel relationship of headquarters with its partners, rather than a top-down approach. “The Fuller Center helped us through our entire transition,” said Marilyn Hoskins, who leads the Southwest Iowa Fuller Center in Shenandoah, Iowa. 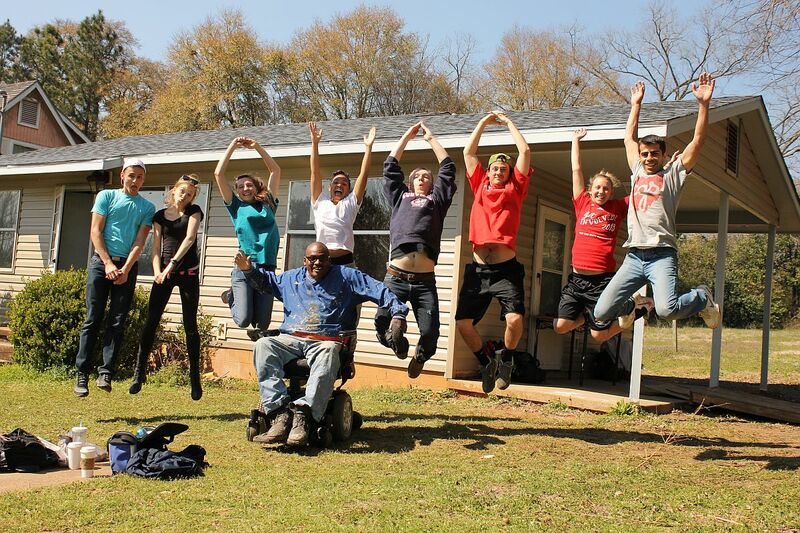 Her organization switched to The Fuller Center last year, officially signing their covenant partnership when the awareness- and fund-raising Fuller Center Bicycle Adventure made an overnight stop in her community during its 2016 summer ride from Seattle to Washington, D.C.
Fuller Center homeowner and volunteer Thad Harris with a group of student builders from Ohio State University. Most transitions, though, from one nonprofit to The Fuller Center are surprisingly simple. “When we interviewed other covenant partners, they talked about the ease of working with Fuller Center as a ‘small-town’ organization.” — Randy Rinehart, Director of The Fuller Center for Housing of Houston, Miss. The Fuller Center for Housing has grown by leaps and bounds since the Fullers hit the restart button on their affordable housing ministry in 2005, but the growth has been steady and not out of control. And while the ranks of covenant partners has increased across the nation and around the world, The Fuller Center only works where it is invited. It does not plant partners, nor does it compete with other organizations to lure their affiliates away.